it's monday, i have to remind myself sometimes. here's a bleep to wake up in your face like outrageous coffee. im transitioning from real sugar to fake, therefore i am not as happy as i normally would be. :) those who know me know im pure awful in the morn (which is noon-ish for me...). step 5 is putting hope in a higher power & admitting truth. npr has discussion going of why the gore's are deciding to split. i say easy. just look at dear al. he obviously is a boring partner/lover/person-in-general (tho progressive environmentally...necessary, thank you, al)--but he aint too pretty, & i bet he just lies around watching 'so you think you can dance' & stuff every night when his ex-lady wanted to put on her fab shoes & go out on the town. 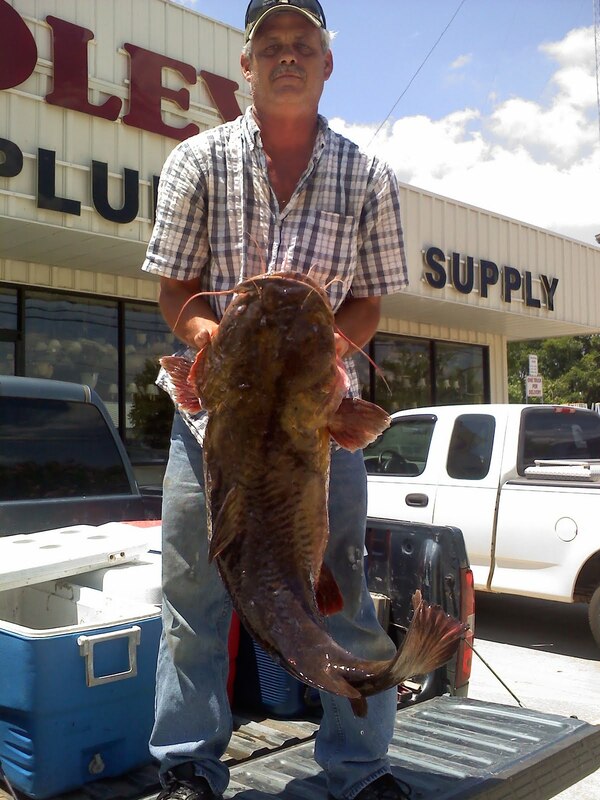 above: our weekly spotlight on LaRue, holding not a snake this week, but another dangerous big animal called the big ole southern catfish (yes hell they will bite you). that's my parent's store in the background. that's LaRue standing in the back of his truck. that's a rather large catfish which mama said he wanted me to see. i am so glad about it! he makes snake jewelry (but of course)--you know, rattler necklaces & stuff & has said he's gonna gift me some. how excited did i get about this? ridiculously. i heart LaRue.